Oh boy, Bao Bao's trying to bust out-bust out no kidding, this time. What a curious little wanderer this six month old baby panda is. I've realized the best times to catch her and mama Mei in action are early in the morning, late at night and around 6 p.m. est. 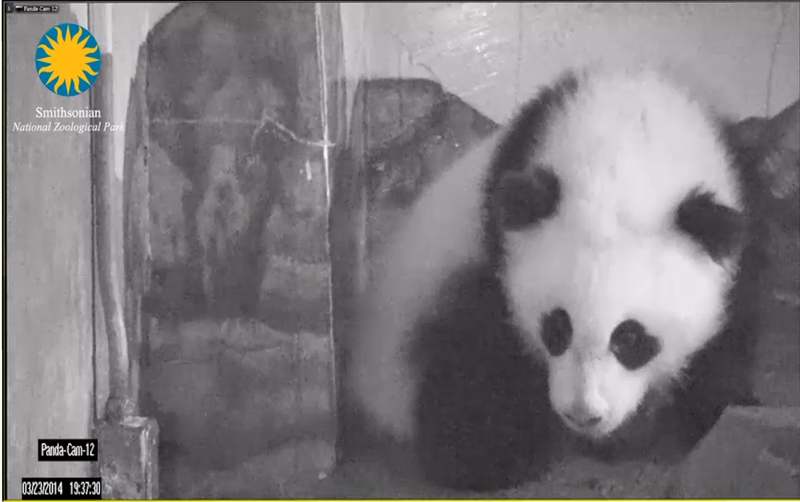 Today, I tuned in around 5:30 p.m. cst and little Bao Bao was up and moving in rare form. She roamed from her den to a main room bamboo stuffed destination and all up in and around the rocks. I made the mistake of clicking off the screen for a minute so I could write something down on another page, and I'm not gone for thirty seconds when what do I hear? Metal clanking against concrete. Not a normal panda bear den sound, even for an avid watcher like me. 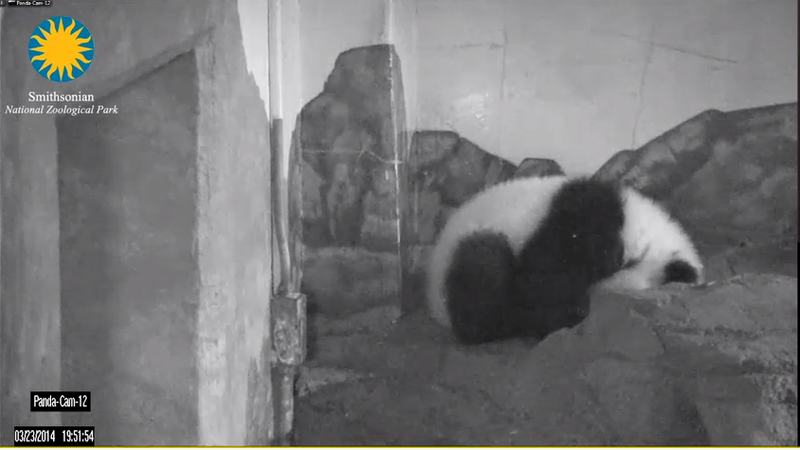 I clicked back onto Ms. Bao Bao's screen just in time to see her trying to make a break for the outside world, via, what I'm assuming is some type of drainage compartment in her home's floor. Smart gal that she is, she'd pulled out the grated plate on top and was nudging it around with her paws, then her nose. Inquisitive beauty that she is, she then continued to stick her paws and mouth down into the hole. Thankfully, she couldn't fit her whole body. Finally, she walked away and moved on to climbing rocks. Can't say as I blame her. I would've gotten bored pretty quick too, had I found the perfect escape into Rock Creek Park (and I was a bear in my prime) but had not been able to squeeze my way into it. Yes sir, little Ms. Bao Bao is turning into one sneaky explorer. I wouldn't be surprised if one day soon when I turn on the panda cams, she's nowhere to be found. In today's adventures...crafty Bao Bao tried to slide open her door lock. Here she is climbing up and down her door bars attempting to exit her home by scaling to the ceiling. And finally here's Bao Bao all tuckered out after her big day of climbing and digging adventures. She is one beautiful cutie! Over twenty-five pounds last I checked. You can also visit her and mama Mei in person at the National Zoo. Do them a favor and don't knock on the glass, just wave and tell her "hi!" Kentucky Derby Contender--Bond! Bond Holder!